Home > Scope > How Important is Heritage? The jumper pictured above was hand-knitted on Inis Mor, the largest of the Irish Aran islands. It was made from locally-sourced wool; wool which has been woven by islanders for generations. Each jumper takes approximately one week to make, and in order to receive the Aran Seal must be entirely hand-crafted by the same person. Spot any problems with the paragraph above? As well as lacking a suitably jolly Gaelic folk backing tune and narration by Liam Neeson, the whole thing is actually total lie – the jumper was made in China, and very likely by machine. But it is a snapshot of the dilemma faced by many traditional western menswear companies who want to keep production in their countries of origin. If it looks good and is cheaper, why should the average consumer spend more on the “real thing”? Regions and towns throughout Europe often have strong associations with certain types of clothing manufacturing. Vigevano, in the northern Italian region of Lombardy, has long been central to the country’s shoemaking industry. As a consequence the city’s shoemakers have amassed generations’ worth of knowledge and expertise. This is reflected in the quality of the shoes they make, but that doesn’t necessarily mean that shoes made in, say, Indonesia, are inferior. There may be some decidedly shoddy Vigevano-based shoemakers who are getting away with producing sub-standard clogs on the back of the city’s reputation, while some great young shoemaking talent in Jakarta might be being unfairly ignored. High-end menswear manufacturing expertise in emerging economies has improved dramatically over the past two decades, a trend that is likely to continue as long as demand remains high. Traditional Western menswear manufacturers have had a tough time of late, and can no longer rely on domestic consumers to support them. There will always be brands whose mystique allows them withstand pressures to relocate production – Louis Vuitton is a case in point. But in recent years many small British manufacturers have been forced to make some difficult decisions, with redundancies the inevitable end result. But it’s not all bad news: some British manufacturers whose futures once looked bleak have been fighting against the offshoring tide. Two fine examples are Sunspel and John Smedley, both of whom have managed to rescue themselves from the brink. Their success lies in careful backroom restructuring and, more importantly, in finding a way to successfully cash in on their heritage – something that is especially valued by well-off consumers in the Far East. The importance of Japan, and increasingly China, to the long-term future of these companies cannot be ignored. Personally, I’m quite fond of learning about a company’s manufacturing history and so on, but there is a danger of heritage overload: reading endless press releases, websites and labels that liberally sprinkle words like ‘finely crafted’, ‘curated’ and ‘authentic’ can reek of pretension, and it’s hard to stick out from the crowd when every other menswear manufacturer is using them. The key to British menswear manufacturers’ survival is to maintain the high quality of their products and remain profitable without relocating production. If John Smedley were to start producing sweaters in China it may very well boost profits in the short term, but it’s highly unlikely that consumers – especially in Asia – will be willing to pay the same price for them once they realise what’s going on: they will perceive the quality as inferior and, crucially, will lose the much-loved “Made in England” label from their cardies. This might benefit other British-based knitwear manufacturers with a similar price point and heritage (like Sunspel), but it would be a loss for the industry as a whole. So, what should we, the consumers, do? It’s true that buying western-made clothing helps keep textile-related skills and jobs in their countries of origin; but – despite the sweatshop horror stories – buying eastern-made clothing ultimately plays a part in pulling the world’s poorest out of poverty. It’s a tricky one. Maybe the best thing to do is simply buy whatever suits you best. It might be ethically dubious, but it’s better than being the kind of person who berates people for not supporting local manufacturing while owning a wardrobe full of Chinese-made clothes. Andrew Watson is the editor of men's style blog www.makethman.com. He lives in Tokyo, Japan. So what is the conclusion? Is heritage important or not? 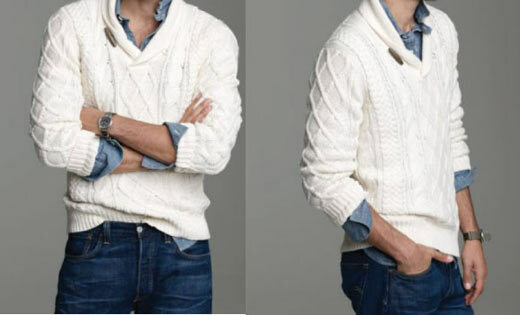 Sir, who is the sweater pictured in this post made by per chance? Augusto: for marketers and manufacturers it can be very important; for consumers I think it’s more a matter of personal preference. Stephen: it’s from J.Crew. I think it was from last year as I can’t find it on their site at the mo.